My friend, Jenny, has had a Mommy & Me Christmas tea for the past few years and we missed last year's due to my work schedule. But my schedule worked out this year and I am so glad we were able to make it! Such a fun gathering...and she pulls out all the stops! Her home looked beautiful and the detail she put into the party was just impeccable! In each tea cup...she had a bell necklace. Seriously- she thought of everything! snowflake sandwiches, wraps, fruit....she had it all! And crafts. Lots of crafts! I thought I did ok taking pictures...but I didn't! Parker made a sparkly angel out of a toilet paper roll, gold glitter, and her cutout handprint. So cute. 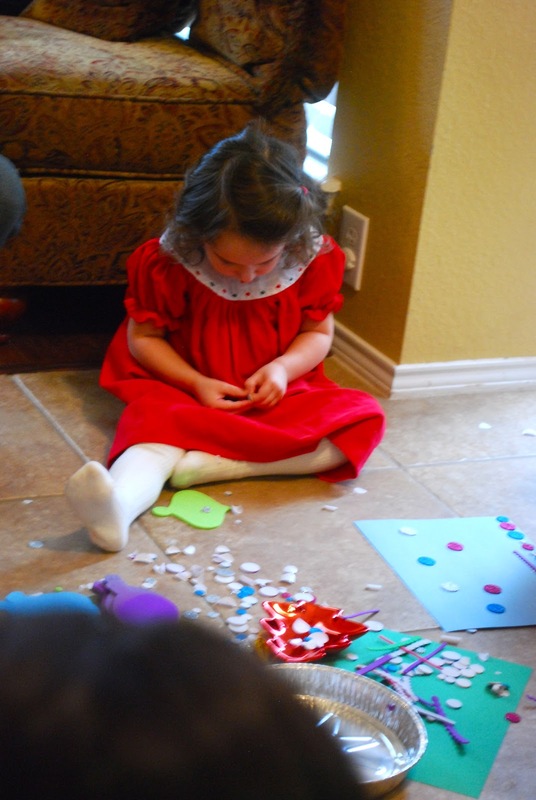 They also used clear ornaments and paint to make the most adorable ornaments! Grace made a bead bracelet. And there was still so much more! That looked like so much fun. My goodness, your hostesses indeed went all out! That looks like a lot of fun! And Jenny did a great job hosting! Lots and lots of stuff!! Kelly's Korner, Santa, & Cupcakes!